Riverview Eye Associates - Optometry in Columbus, OH US :: J. Bradley Oatney, O.D. Dr. Oatney knew he wanted to become an optometrist after his own experience with being a patient. “I was working as a construction worker with no goggles on and got a piece of metal stuck in my eye. After staying up all night in agony, I finally visited an eye doctor, who removed the metal. I decided to go into the study of optometry after that.” Dr. Oatney graduated from The Ohio State University College of Optometry in 1987, where he was awarded membership into the Beta Sigma Kappa International Optometric Honor Society. Dr. Oatney has been in private practice in Columbus Ohio for over 30 years and has extensive clinical experience and enjoys treating a wide variety of eye care needs. Dr. Oatney has served as the eye care consultant for the inmates at the Ohio Department of Corrections facilities for 13 years providing full scope medical optometry services. He has performed more than 5,000 bedside eye examinations for patients in local nursing homes, long-term care facilities for non-ambulatory disabled children and adults, and at an outpatient neuropsychiatric hospital. He also had the exceptional opportunity for 2 years to work side by side with a retinal surgeon. Dr. Oatney has the privilege of participating in medical missions trips each year to Ecuador and Africa. “It is a real joy to be able to provide hope and eye care for people in unserved areas around the world.” Locally, Dr. Oatney started the Xenos Free Eye Clinic located at 1934 N 4th Street, 43201 for anyone who is uninsured and in need of eye care. Walk in appointments are available at 6pm on the first and third Mondays of each month. 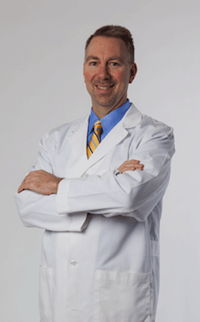 Dr. Brad is fluent in Spanish and comfortable treating Spanish-only speakers. He occasionally makes house calls for patients who are unable to come into the office. Dr. Oatney has been a member of the Lions Club International since 1990 and received the “Outstanding Service Award” from the Sight Program of the International Association of Lions clubs for providing free eye care for those in need. Dr. Oatney has served on multiple medical advisory boards and lectures frequently around the country on new innovation and technology in the world of contact lenses. He also writes for industry publications. Outside the office, Dr. Oatney enjoys traveling with his family and is active in his community, particularly his church, Xenos Christian Fellowship, as a deacon and former school board member.” He also enjoys cooking and all types of fitness and had a lot of fun being a wine judge for years at The Food and Wine Affair.